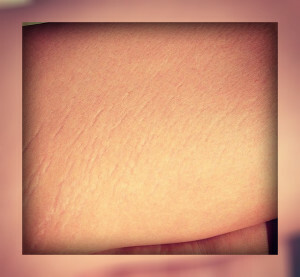 Striae appear when derma (the second layer of skin) stretches faster than epidermis (upper layer). Length, width and depth of stretch marks can noticeably vary. When tissue of derma tears, cicatrical tissue forms and becomes apparent. At first, stretch marks can be red or violet, but later they fade. Fresh striae can cause light itching and tingling. What causes stretch marks on thighs? Striae on thighs can come out on anyone. For example, fast-growing teenagers or bodybuilders are often the victims of striae. Pregnancy is one of the reasons for stretch marks appearance. Most of women find such “surprises” on their body at late pregnancy, however they can arise even in the first trimester. Genetics in a large measure determines underlying risk for striae formation. If your sister or mother had stretch marks on thighs, there is a high probability that they will appear on your skin. Preventive measures help to reduce number of striae. It is especially important for adolescents, because they are very sensitive to any changes of the body. Having found stretch marks on thighs, teenager can gain low self-esteem. Developing of stretch marks is typically connected with fast weight gain. Control over your own kilos is evident to maintain skin in good condition. Try not to chub up, especially within short time, including period of pregnancy. Stretch marks on thighs can appear even at slim and thin young mothers. Experts consider that in this case hormones are to blame. But even then there is no point to balk healthy eating. Healthy diet contributes to skin elasticity, that is also important for stretch marks prevention. Antioxidants and unsaturated fats help to moisturize skin and strengthen collagen fibers. Drink more water. Hydration is necessary for stretch marks prevention. Go in for sports. Though bodybuilding can cause striae, moderate physical activity is necessary for their precaution. Do not forget about special exercises for thighs – strong muscles support skin, reducing loading on it. Rub skin with a hard brush regularly. It stimulates blood circulation and serves as a preventive measure for striae. How to get rid of striae? Moisturizing. Areas of skin with striae need additional moisture. One of the common natural ingredients with intensive hydrating effect is cocoa oil. Apply cream with this oil on thighs after shower. It will lessen roughness of skin. Laser or light therapy. Ray of laser splits scar tissue and stimulates collagen producing. This method is used for fresh stretch marks treatment. For older striae it is rather to choose light therapy which entails an outthrow of melanin in epidermis. Chemical peeling is another extreme way of stretch marks elimination. Skin on thighs is overspread with solution which causes intensive exfoliating of upper layer cells. This affection stimulates producing of collagen, which smoothes the way of skin regeneration. Stretch mark removal cream Revitol .